This weekend the local HMGS-South group played a Sudan game using The Sword and the Flame colonial rules (20th Anniversary Edition) and the Gunboats and Dhows rules. 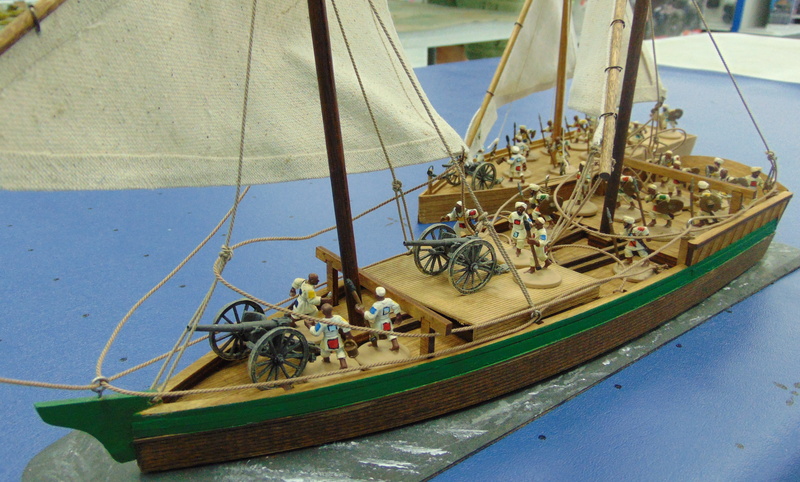 Two river steamers manned by the Royal Navy were tasked with capturing two small Dhows docked on the Nile. Fortifications covered the approaches to the docks and additional Ansar troops arrived by boat. The boats used were made by Last Stand Dan. The Dhows are initially unmanned. … and is quickly sunk. The crew eventually makes it to shore. One of the small Dhows gets underway. A second large Dhow appears and blows up a British steamer with a lucky hit. A hidden Ansar gun fires with little effect, and is quickly silenced. Most of the British crew survives the explosion of their boat and captures the opposing Dhow. The Ansar crew of the small Dhow is wiped out. The empty small Dhow is captured by the British. The British captured one large and one small Dhow, sank a large Dhow and destroyed several Ansar forts. One British steamer was destroyed, but otherwise British casualties were light.